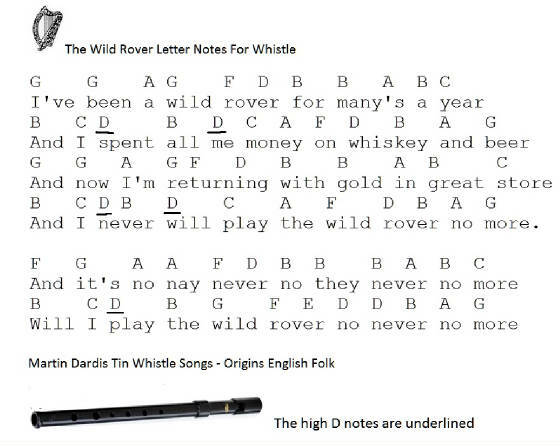 The Wild Rover Tin Whistle Sheet Music Notes. Key Of D Whistle. a traditional pub song from England. Although the notes are set to the key of D whistle these notes will still work for most whistles. A little reminder that all the sheet music for the tin whistle are only a guide to help you get started. This piece of music reaches the second octave on the whistle which means you've to blow harder to reach the high notes. I have included an easy version using the letters over the words. Below are the basic letter notes for those who don't read sheet music. The youtube video is by Jean who is playing basically the same notes as the piece of music above the video. Jean uses ''Fillers'' between verses, such as after ''And It's No Nay Never'' , this ads a lot to the tune and makes it more interesting to play. Play it your own way but keep the structure of the tune intact. Here are the notes that Jean is playing and should help you. 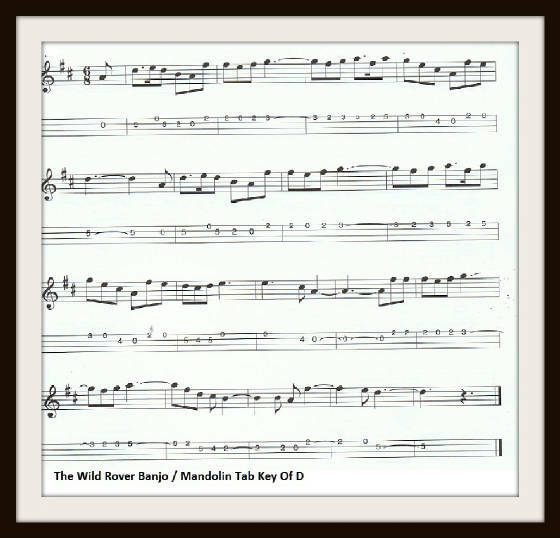 The banjo / mandolin tab above is usually played in the 3/4 timing. Try it in the 6/8 as it would be great practice for you when playing the jigs. It's in the key of D and played on the A and E strings only.